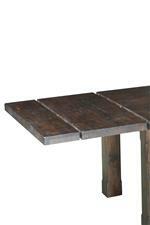 This functional dining table will bring rustic beauty to your dining room. 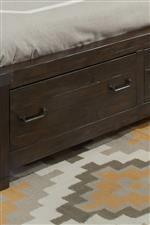 The piece is crafted from robust pine solids in a rustic pine finish for that gorgeous forest home look, while the simple, clean design makes it a sure fit for any style room. This table also includes two 16" leaves to allow for lengths of 80" without leaves and then 96" and 112" with one and two leaves respectively. You'll love having this table and the atmosphere it creates in your home. The Pine Hill Rectangular Dining Table with 2 16" Leaves by Magnussen Home at AHFA in the area. Product availability may vary. Contact us for the most current availability on this product. 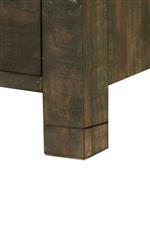 D3561-20B Rectangular Dining Table Base 1 5" 5" 29"
D3561-20T Rectangular Dining Table Top 1 80" 40" 5"
Leaves Two 16" leaves extend table from 80" to 112". 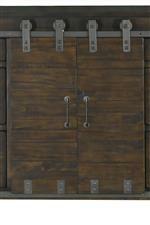 With the pieces from this collection, you'll create a beautiful atmosphere that is both rustic and urban. 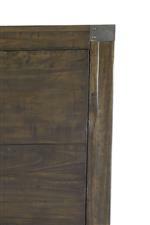 The entire collection is crafted from robust pine solids in a rustic pine finish, while being paired with subtle metal accents and aged iron hardware for an extremely stylish juxtaposition. The pieces boast modern functionality as well, with storage footboard beds, built-in USB chargers in select pieces, wire management and practical sliding doors. You'll love having this stylish collection grace your home. 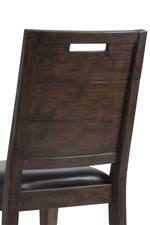 The Pine Hill collection is a great option if you are looking for Rustic Industrial furniture in the area. Two 16" Table Leaves to Extend Surface from 80" to 96", and then to 112"
Browse other items in the Pine Hill collection from AHFA in the area.